The Little Black Tank is here! 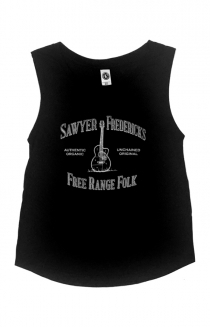 Sawyer's New Free Range Folk Design Ladies Little Black Tank has Sawyer's newly crafted Free Range Design silkscreened on the front in light gray ink. Sawyer's new Free Range Folk Design has a new sentiment selected by Sawyer. Newly added to the Free Range Folk Design are the words "Authentic, Organic, Unchained, Original", these words are descriptive not only of Sawyers musical style, they also speak to Sawyer's life style. Sawyer's new Free Range Folk Tank has generous width straps at the shoulders and is rounded at the hem. The Little Black Tank is a wardrobe staple, casual for day or night. Order up a size and it's a perfect bathing suit coverup! Sawyer's new Free Range Folk Little Black Tank is lightweight and super soft. 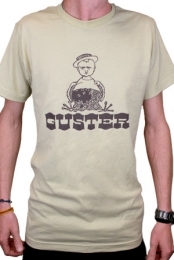 The Tank is a TriBlend of 50% polyester, 38% cotton, 12% rayon.